Reference number for this case: 20-Oct-54-Feldbach. Thank you for including this reference number in any correspondence with me regarding this case. The regional newspaper L'Alsace reported on October 22, 1954, about a "strange luminous phenomenon above Feldbach". The article stated that on October 20, 1954, around 07:15 p.m., Feldbach schoolchildren alerted their teacher about their very clear sighting in North-East direction, at altitude and distance difficult to assess, of an unusual glow in the sky, like a flash of light similar to that of a star of the first magnitude and changing color, alternately green, white and red, at the frequency of 5 seconds. The object shone intensely, and was moving slowly and irregularly, sometimes circling, within a visual displacement angle of about 20 degrees. The appearance of the object also changed and became more or less radiant, sometimes like a point, sometimes with two bright spots in the center. Several absolutely reliable people observed this phenomenon for about an hour. As compass indicated this was in the direction of the Blotzheim airfield, some witnesses initially thought a plane evolved over the airfield, but information asked the next day by the newspaper to the Blotzheim control tower, they had been assured that no plane had landed or taken off that day between 7 and 8 p.m..
Wednesday evening, around 7:15 p.m., Feldbach schoolchildren came to alert their teacher that they had seen a strange light in the sky. Indeed, towards the East-North-East, at an altitude and distance difficult to assess, a luminous glow similar to that of a star of the first magnitude and changing alternately color, green, white and red, at a frequency of 5 seconds was clearly visible. The object that shone intensely moved slowly and irregularly, sometimes circling, within a visual angle of about 20 degrees. The appearance of the object also changed and became more or less radiant, sometimes with a dot, sometimes with two bright dots in its center. Many absolutely reliable people observed this for about an hour. As the direction measured with a compass was substantially that of the Blotzheim airfield, some witnesses believed initially that a plane was flying over the airfield. With the information requested yesterday at the Blotzheim control tower, we were assured that no plane had landed, or taken off Wednesday night between 7 p.m. and 8 p.m.
Christian Valentin indicates that on October 20, 1954 at 07:15 p.m. in Feldbach, pupils warn their teacher of the presence of a strange gleam in the direction of the airport of Blotzheim, at an altitude and a distance "difficult to evaluate." The object is described as having the size of a star of first magnitude, which scintillates intensely, alternating white, green and red colors. It moves slowly and irregularly in a visual angle of twenty degrees, sometimes describing circles. The object changes sometimes its appearance in becoming of more or less radiant with sometimes one or two luminous points in the center. Several people observed the phenomenon during one hour. Former journalist Christian Valentin published in 2012 a very interesting book telling the story of UFO sightings, flying saucers sightings, in Alsace, from the beginning to 1980. He noted that the observation is to be compared with the strange phenomenon in the Black Forest in Waldau: which he evokes further in the book. A disc of yellow and blue colors appeared in the southern sky, above the mound of the Hochfirst. After a few minutes, the disc split into four lights that moved independently, and disappeared simultaneously in a tremendous acceleration. They reappeared ten minutes later and resumed their maneuvers, appearing and disappearing quickly. Several witnesses said that it was as if they had a bright side ant the other side dark, and showed the two faces alternatively, all simultaneously. The newspaper insists on the fact that the sky was cloudless then. Blotzheim is 19 km away and at a direction of 66° (approximately North-East) from Feldbach. With an observation period of one hour, one can immediately think of a planet or star. I thought of the planet Venus, almost ideal here, although we would then forget details like the displacement angle of 20°, impossible for any astronomical body whatever the trembling of the air may have been. But Venus was down at 18:09. A time error can be excluded, at 06:00, p.m., it is not night enough, only earlier was Venus above the horizon, and then, it was still in daytime. Worse, Venus was at 225°, not 66°. The most likely astronomical body, the "least worst", would be the Cappella star, rising at 30° to a 15° elevation at 06:30 p.m. in the sky, to be at 40° and an elevation of 16° at 07:20 p.m., and at 08:15, arriving at 45° and an elevation of 22°. This is hardly convincing to me, as in this rising move, surrounded by other stars, Capella would have been fixed in relation to the other stars, and nothing would have allowed it to really match the details in the description. 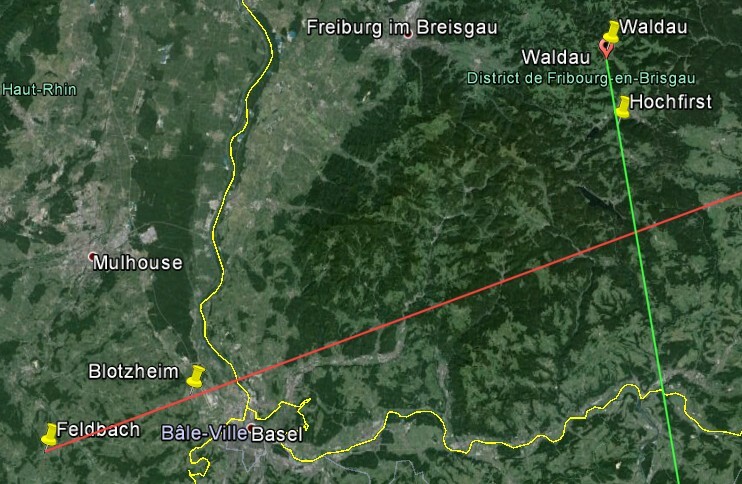 Now, it is also possible to consider the observation in Waldau. The chronological concordance is established, what about the localizations? We have good directions of observation for the two places, it is possible to triangulate the phenomenon. If it was the same, it was at the intersection of the green and red lines. This is 77 km from Feldbach, and 19 km from Waldau, between Schluchsee and Grafenhausen. So I looked for other sighting reports which would be consistent with those two, in France, Switzerland and Germany, within 200 km of the found spot. In vain for now. [la1] "Etrange phénomène lumineux au-dessus de Feldbach", article in the regional newspaper L'Alsace, France, page 7, October 22, 1954. [cv1] "1954, l'Année des OVNIS - en Alsace et dans le Monde", dossier by Christian Valentin, in the quarterly magazine "Saisons d'Alsace", #23, page 92, summer 2004. [cv2] "Mythes et Réalités des Phénomènes Aériens Non Identifiés - Histoire des soucoupes volantes en Alsace jusqu'en 1980", book by Christian Valentin, Grimoires d'Alsace publishers, France, page 47,70, 2012. 0.1 Patrick Gross May 7, 2005 First published. 1.0 Patrick Gross March 24, 2009 Conversion from HTML to XHTML Strict. First formal version. 3.0 Patrick Gross March 3, 2016 Additions [la1], [cv2], Summary, Explanations. This page was last updated on March 3, 2016.